Early stages of COPD can develop without noticeable shortness of breath. 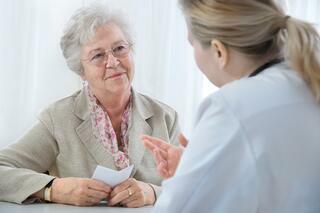 Many people mistake early onset COPD for normal signs of aging. Due to many people being diagnosed with COPD in the later stages of the disease, many patients aren’t treated early on and have a harder time managing symptoms. It is important to start talking with your doctor as soon as you recognize excessive coughing, increased phlegm production, tightness in your chest, or shortness of breath. Maintaining healthy levels of oxygen is important for your brain to function properly and for the overall health of all your muscles, tissue, and organs. Your COPD means you have less oxygen flowing through your body. Most likely it was brought on by smoking for a long period of time or exposure to harmful chemicals or dust. The tiny air sacs in your lungs are damaged and the walls of your airways are inflamed which leads to increased phlegm production. The increased phlegm production can clog your airways making it hard for oxygen to get to your lungs. Oxygen therapy, medications, lifestyle changes, or even operations are used to treat symptoms of COPD. Your doctor may also recommend noninvasive ventilation to treat your COPD. Noninvasive Ventilation: What is it? Noninvasive ventilation assists you in taking a full breath and helping your body receive the amount of oxygen it needs to function properly. Also referred to as Noninvasive Positive Pressure Ventilation (NIPPV), this treatment is an alternative to being hooked up to a ventilator. NIPPV provides support for your COPD through your upper airways. 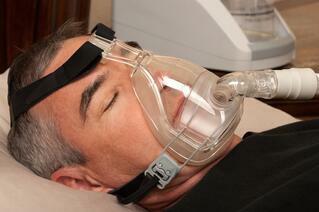 A tightly fitted nasal or facial mask provides a mixture of oxygen and air from a machine. NIPPV makes it easier to get oxygen down to the damaged tiny sacs in your lungs to facilitate the oxygen/carbon dioxide exchange. What Types of NIPPV Treat COPD? If you are recommended NIPPV to treat your COPD, you will become familiar with the terms continuous positive airway pressure(CPAP) and bilevel positive airway pressure(BiPAP). Usually used with people with sleep apnea, CPAP and BiPAP can control your COPD symptoms and improve your quality of life. CPAP devices are effective in improving lung function which is music to the ears of COPD patients. A study in the American Academy of Sleep Medicine found that CPAP can reduce the mortality rates of patients who have COPD. With your COPD you experience chronic cough, fatigue, chest tightening, and difficulty breathing. Problems with sleep for people who have COPD is common. Overlap with COPD and sleep apnea are present in approximately 20 to 40 percent of patients. CPAP therapy uses a small bedside machine that pumps air through a tube and into a mask that’s worn over your face or nose while you sleep. 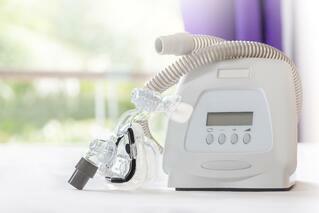 CPAP therapy is very similar to standard oxygen therapy that COPD patients use. CPAP helps you with a single pressurized burst of air when you inhale. 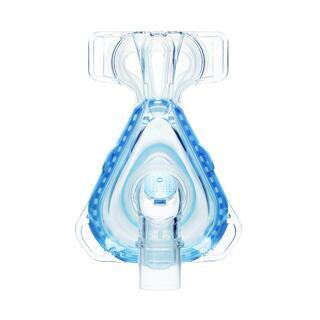 CPAP will increase oxygen levels, work to help regulate your breathing, and lessen the burden on your heart. If you have COPD, ask your doctor about CPAP therapy. A sleep study is performed to measure your oxygen level while you sleep. The test helps identify moments of interrupted breathing and other abnormalities that affect your sleep cycle. It will take some time for you to get used to the mask and the new process. However, if it improves your oxygen level, gives you uninterrupted sleep, and boosts your energy level, it may be worth exploring. Bilevel positive airway pressure (BiPAP) therapy is used regularly to treat COPD and the diseases symptoms. BiPAP machines fit on a table top and have tubing and a mask. All you do is put the mask over your nose and/or mouth to receive two levels of air. One pressure level is delivered when you inhale, and a second lower pressure is given when you exhale. Initially, this treatment could only be done at your doctor’s office. Now it can be done at home. The newest BiPAP machines have a breath timer that can sense and adapt to your breathing patterns. It increases or decrease pressure to deliver the appropriate amount of air to your body. If you have COPD, you likely suffer from shortness of breath. Shortness of breath and wheezing are common symptoms that progressively get worse for you over time. BiPAP therapy is designed to focus on your erratic breathing patterns. The BiPAP machine provides much needed relief to your lungs, heart, and chest muscles by aiding in the breathing process. BiPAP therapy can be used when your awake or asleep. It is recommended at night to keep your airways open while your sleeping. Your breathing is much less labored when you sleep. This allows the machine to pump pressurized air into a better working breathing environment. During this time, your body receives more oxygen and efficiently get rid of carbon dioxide. Studies have shown that if you have COPD and high carbon dioxide levels, regular use of a BIPAP machine can improve COPD symptoms, allow you to breathe easier, and increase your chances at a longer life. A common mistake is not having the mask fit tight enough against your face. If the mask isn’t tight, air escapes and you do not receive the full benefit of the treatment. To prevent air leaking, be sure to purchase a mask that properly fits over your mouth, nose, or both. When trying on the mask, run your fingers over the edges to feel for any gaps. Both CPAP and BiPAP are types of noninvasive positive pressure ventilation (NIPPV). The key difference is CPAP only delivers one level of air pressure. You only get the help when you inhale and you’re on your own when you exhale. This can be difficult for some patients. These patients will benefit more from the BiPAP therapy which delivers air pressure on both the inhale and the exhale. Working with your doctor is the best way to figure out if CPAP or BiPAP therapy is right for you. Depending on your symptoms and history, your doctor may decide to go with medication or oxygen therapy to start or maybe a combination of the two. What are other patient’s experiences with CPAP or BiPAP? How many times a day, week, or month will I have to do this therapy? Thanks for taking the journey to learn a little more about CPAP and BiPAP therapy. Please comment below and share any experiences, comments, or questions you may have.